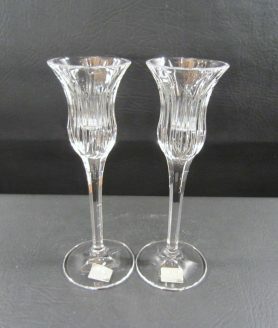 This stunning set of 5 vintage Fostoria rose 6036 cut champagne sherbet glasses, are in excellent condition. The 827 cut rose design and glass is bright, sparkly and clear with fantastic detailing. This stunning set of 5 vintage Fostoria rose 6036 cut champagne sherbet glasses, are in excellent condition. The 827 cut rose design and glass is bright, sparkly and clear with fantastic detailing. The 6036 stem has beautiful rounded curves that fit beautifully in your hand. They have such a beautiful ring to them. Fantastic set that will make great replacement pieces or additions to your current set. Fantastic set! *** Please check out the Ice Tea glasses in this same pattern we also have for sale. Excellent clean pre owned condition with no cracks, chips, or stain’s. Clear, bright and sparkly. Fantastic set! These Parfait water with etched design glasses goblets set of 5 will be the perfect addition to your next party. They are a great size and very thin and light in weight for either water or your favorite parfait. Details: 3 3/8 inches diameter top x 6 inches tall Unknown maker Very Good Used condition with no visible chip’s, cracks or repairs. *** All measurements are approximate. These beautiful Luminarc France Black Stem Octagon Champagne Flute glass set of 4 will be a great addition to your next party. They are crystal clear in color with a stunning black stem. The bottom of the stem are marked Luminarc France. Details: 2 3/8 inch diameter x 8 5/8 inch high Hand wash recommended Excellent Used clean Condition. No chips, cracks or repairs. *** All measurements are approximate.